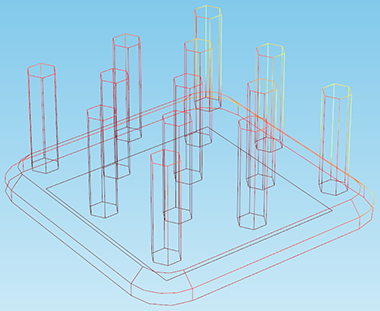 Plotting visual simulation results on a model geometry is a great way to unveil the sometimes-mysterious physics happening behind the scenes in a device. Like learning a language, knowing how to use postprocessing tools helps designers investigate and understand their designs and processes more fully. 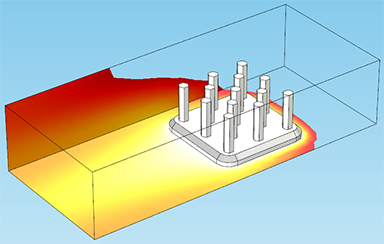 Surface, volume, and line plots are three of the most common plot types used in postprocessing, and are applicable to many simulations. 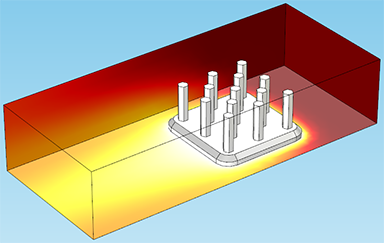 To demonstrate these three plot types, I’ll use the example of an aluminum heat sink, often used for cooling electrical circuitry components. 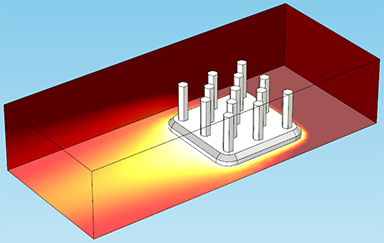 This model is available from the COMSOL Multiphysics Model Libraries if you have the Heat Transfer Module or CFD Module. 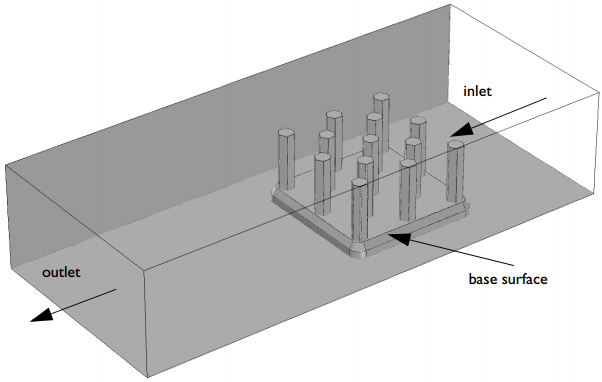 The heat sink is made of aluminum, shaped with a cluster of pillars for cooling, and mounted on a silica glass plate. In the model set-up, it sits inside a rectangular channel with an inlet and outlet for air flow. 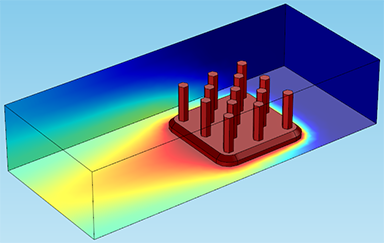 The base of the heat sink initially experiences 1 watt of heat flux, which is generated by an external heat source. 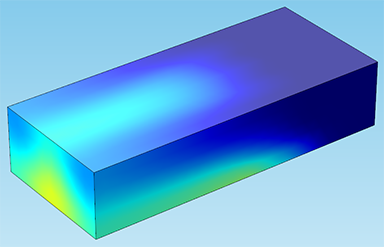 This model includes coupled thermal and fluid flow effects to analyze temperature gradients and cooling power, resulting from thermal conduction and convection. 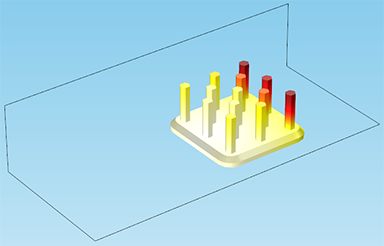 In some ways, it is easiest (visually) to use surfaces to demonstrate the plot settings in COMSOL Multiphysics. 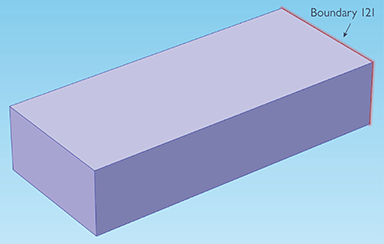 Surface plots are used to show results quantities on the boundaries of a model’s geometry. They can be added either by right-clicking the Results node of the Model Builder or by using the Results tab in the ribbon. Now, I’ll right-click the View node and choose Hide Geometric Entities. I’ll set the geometric entity level to Boundary. Then, I’ll select the faces of the channel that are blocking our view of the heat sink (boundaries 1, 2, and 4). If you’re following along in the model, you might also select boundary 121, which is the channel inlet. The boundaries will turn purple when clicked, indicating that they are selected. 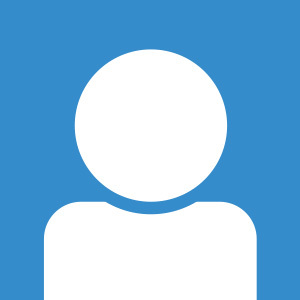 Note that choosing a selection of boundaries in a plot — similar in some ways to hiding geometric entities — allows you to show results on only the boundaries you’ve chosen. This is done by creating a solution under the Data Sets node: Right-click Data Sets and choose “Solution”, then right-click the Solution node and choose “Add Selection”. 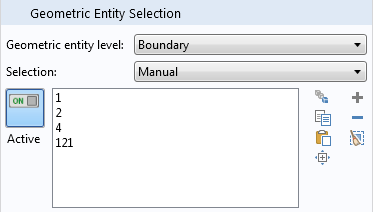 This selection works the same way as for hiding entities; set the geometric entity level to the correct type and choose the boundaries (or edges, or domains) that you want. When you create a new plot, make sure to choose this solution as the data set. You can also control the color and data range by dragging the sliders under the Range tab. 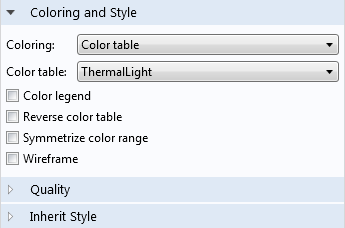 These two options allow you to visualize results on only a specific interval. Note: All of the examples shown will use 3D plot groups, but they have an equivalent in 2D as well. For instance, in a 2D plot group, this type of plot would be used to show temperature on the edges that lie in a certain plane. That’s it for a run-down of these plot types and how to control their coloring and style! Hopefully this demonstration will help you get started in some effective postprocessing. These are just a few of the plot types available in COMSOL Multiphysics — stay tuned for future posts demonstrating other plot techniques, such as arrows, streamlines, contours, and some application-specific types. We will also demonstrate using cut line plots, which allow you to plot any quantity along an arbitrary line through the model.